Celebrate the start of the academic year with the MavsMeet Convocation at 4 p.m. Wednesday, Aug. 26, at College Park Center. Comedian,TV host, actor, and writer Shayla Rivera will give the keynote address. President Vistasp Karbhari will make remarks, as will Student Congress President Emmalie Moe. Timothy Quinnan, vice president for student affairs, will serve as master of ceremonies. Musical performances will include the UT Arlington Jazz Ensemble, UT Arlington Marching Band, and Mariachi UTA Los Potrillos. Stay around for live music, games, and fun at the AfterParty on The Green at College Park. Other Maverick Stampede events include Waffleopolis, Super Service Saturday, Ask Me Days, the Maverick Cookout Featuring the Activity Fair Day, college and department socials, and much more. Maverick Stampede stretches into September with informational and social events for academic departments, student organizations, and more. See the Maverick Stampede schedule for more details. 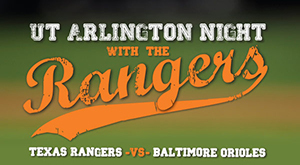 Put on your Maverick blue for a night of fun when the Texas Rangers take on the Baltimore Orioles for UTA Night with the Rangers on Friday, Aug. 28. Game time is 7:05 p.m.
Tickets are $10 at utatickets.com for seats in sections 208-211 of Globe Life Park. You must bring your receipt to the College Park Center Box Office and exchange it for actual tickets by noon, Friday, Aug. 28. The box office is open 9 a.m.-5 p.m. Mondays-Fridays. For groups purchasing tickets separately but who want to sit together, have group members pick up tickets together at the box office. There will be no exchanges once tickets have been issued. New kid on the block: A concept drawing shows how the six-story Science, Engineering Innovation and Research Building would look from the south. The building will be across South Nedderman Drive from the Life Science Building and close to Pickard Hall. 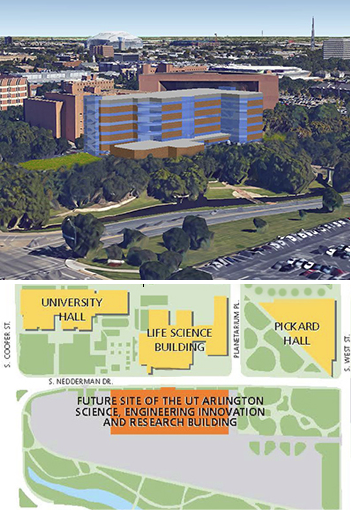 UT Arlington is advancing plans for a new six-story Science, Engineering Innovation and Research Building to help meet increasing student demand and to further the University’s emerging concentration in health science initiatives. The 200,000-square-foot building will feature a structural steel and glass atrium. It will be located southwest of Pickard Hall, home of the College of Nursing and Health Innovation, and south of the existing Life Science Building. The SEIR Building will include large multi-use collaborative spaces, large classrooms and lecture halls, and innovative research and teaching labs. State lawmakers approved $70 million in Tuition Revenue Bonds to support the project earlier this year, and the UT System Regents approved $20 million for the building last week. Work on the project is expected to begin in 2016 with completion in 2018. Read more about the Science, Engineering Innovation and Research Building and the UT System funding. 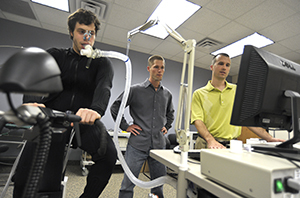 Healthy degree: Dr. David Keller, right, associate professor and chair of kinesiology, works with students in his research laboratory. Keller also is associate dean of the College of Nursing and Health Innovation. UT Arlington will soon welcome doctoral students into a new kinesiology program designed to elevate the excellence of the institution’s research in physiology, movement science, healthy living, and other health science disciplines. The UT System Board of Regents’ Academic Affairs Committee authorized UT Arlington to establish a new Doctor of Philosophy degree program in kinesiology at the College of Nursing and Health Innovation. The proposal will be submitted to the Texas Higher Education Coordinating Board for review and appropriate action. The first students will be enrolled in 2016. Read more about the kinesiology Ph.D. program. UT Arlington’s virtual parking management system, MAVPark, is an online service that allows students, faculty, staff, and visitors to purchase parking permits, manage payments for campus parking meters, and review and pay parking citations—all without standing in line. The system increases efficiency for customers and eliminates the need for parking decals and paper citations. MAVPark uses vehicle-mounted license plate readers to identify license plate numbers of parked vehicles for comparison against the virtual database of permitted vehicles. To purchase a parking permit, visit uta.edu/MAVPark and click on Obtain a Permit under the big blue P. Student parking permits are $165 for the 2015-16 academic year. Users may enter up to three license plates in the system, which provides greater flexibility for those who may drive more than one vehicle to campus. Permits allow only one registered vehicle to park on campus under a single permit at any time. Read more about MAVPark. Read more about the 2015-16 parking permits and regulations. Not sure? Go to whatismybrowser.com to identify your browser and check if it is up to date. If you need further assistance, contact the Help Desk at helpdesk@uta.edu or 817-272-2208. Learn about the 10 technology tools that you can check out. Join your fellow Mavericks for a morning of community service Saturday, Aug. 29, at Mission Arlington, the Community Garden, Arlington parks, and more. Sign up to volunteer for Super Service Saturday. Meet at 8 a.m. in the foyer by the Bluebonnet Ballroom and Rosebud Theatre in the E.H. Hereford University Center. Groups will leave for their sites promptly at 8 a.m. and conclude work at noon. Volunteers will receive a free T-shirt and lunch. To participate, contact the Leadership Center at 817-272-6327 or utavolunteers@uta.edu. Super Service Saturday is coordinated by UTA Volunteers!, The Big Event, and Alternative Breaks and is sponsored by the Division of Student Affairs as part of Maverick Stampede. Have your organization or program represented at the Maverick Cookout Featuring the Activity Fair Day on Wednesday, Sept. 2. The event is part of the Maverick Stampede events to welcome students to campus for the fall semester. Hundreds of campus and community resources and opportunities will be represented along with live music and food. A limited number of tables are available. Sign up through the Student Activities and Organizations website by 5 p.m. Monday, Aug. 31. Mavericks lent a hand or two during Monday's Residence Hall Move-in Event, an annual activity to help students settle into their on-campus homes for the semester. See who moved in and who helped them in the Move-in Day slideshow. The University Bands program is looking for students to perform with the 2015 bands and color guard. Musicians can join one of the band ensembles. The Maverick Marching Band, which is 100 years old, will debut new uniforms this fall. Students with previous color guard experience or who are familiar with dance and equipment skills are needed. The color guard will be an integral element of the UTA Marching Band field show, which includes costumes and choreography. Color guard members will earn two course credits. Interested? Email John Zastoupil, director of the Maverick Marching Band, at zastoupil@uta.edu. The UTA Choirs will hold auditions for the fall semester Wednesday-Friday, Aug. 26-28. You do not have to be a music major to be a choir member. Three choirs need singers with previous choral experience or who can read music. The choirs require course enrollment for one-hour elective credit. Students, faculty, and staff can learn about the Institutional Review Board submission process, how to conduct ethical research studies with human subjects, and more at the new, improved IRB Mini-Conference. The conference is 9 a.m.-4:30 p.m. Friday, Sept. 25, in the upstairs lounge of the Maverick Activities Center. Sessions include what to expect during the IRB review process, hot topics in human subjects research, and a sampling of protocol case studies. Those attending can earn credits for RCR training and human subject training requirements. The UT System Board of Regents has approved an agreement that will enable the WNBA team relocating from Tulsa, Okla., to play the next five seasons at College Park Center beginning in 2016. The Tulsa Shock women’s professional basketball team will host 17 regular season home games a year at College Park Center, attracting more than 75,000 ticketed guests annually. Because the WNBA season runs May through September, the collegiate and pro basketball seasons will have minimal overlap. Read more about the Tulsa Shock. Sign up for fall semester Greek recruitment online with the College Panhellenic, Interfraternity Council, Multicultural Greek Council, and National Pan-Hellenic Council. Enrollment for student health insurance coverage for the fall semester is open through Thursday, Oct. 1. Coverage and enrollment information is online. Suggest a great speaker for TEDxUTA 2016. Complete the nomination form online. TEDxUTA provides an opportunity for people to share ideas. An independent organization, TEDxUTA is designed to give communities, groups, and individuals the opportunity to stimulate dialogue at the local level. The Office of the Texas Comptroller of Public Accounts says students should be aware of a fraudulent check scam in which criminals are using the name Texas Tuition Promise Fund to defraud the public. Intended victims—usually students—will receive a check in the mail identifying the Texas Tuition Promise Fund as the payer. The checks may appear to have been issued from a SunTrust Bank account, but are, in fact, fraudulent. Shortly thereafter, the intended victim will be contacted via email and asked to deposit the check in their bank account, withdraw an additional sum, and forward the cash to another person. The Texas Tuition Promise Fund is in no way involved in this fraud. No person legitimately representing the Texas Tuition Promise Fund would ever request that a payee forward funds to anyone. The Office of the Texas Comptroller of Public Accounts in conjunction with NorthStar Financial Services Group, LLC (the fund administrator) has contacted SunTrust Bank and notified the proper authorities of this fraud. If you receive an unexpected check from the Texas Tuition Promise Fund and are asked in turn to send money to someone else, contact NorthStar Financial Services Group, LLC at 1-877-826-9777. If you or anyone you know has been a victim of this crime or information related to it, call the UT Arlington Police Department at 817-272-3381. Regular registration ends for fall semester. Deadline to submit record of meningitis vaccination for new students and students not enrolled in spring if under 22 years old. Deadline for summer graduates to submit transfer coursework. Registration for the fall semester continues with classes starting Thursday, Aug. 27. Check the Schedule of Classes for class times and availability, and check to see if you need to see an academic adviser before you’re eligible to register. Your advising status is available in your MyMav Student Center. A list of academic advising offices is online. The transfer work submission deadline is Friday, Aug. 28, for students who applied to graduate in summer. Read more about graduation deadlines. MyMav Mobile allows students to conduct UT Arlington academic and social activities on-the-go through the use of their smart phones and other mobile devices. On your mobile device, go to the MyMav Mobile link and save to your home screen. To access MyMav, click the PS Sign-in icon from the main screen and log in using your UTA NetID and password. UT Arlington Libraries Special Collections spotlights professional wrestling in its new exhibit "Ringside: Memories of World Class Championship Wrestling." The exhibit features 34 photos taken by Cirrus Bonneau, who spent Monday nights in 1982 and 1983 at the Will Rogers Coliseum in Fort Worth capturing the interplay between the costumed stars and their enthralled audience. Bonneau’s photos also capture Dallas’ character during a time when pro wrestling was divided among regional territories across the country. The exhibit is on display through Jan. 16, 2016, on the sixth floor of the Central Library. Gallery hours are 9 a.m.-7 p.m. Mondays, 9 a.m.-5 p.m. Tuesdays-Saturdays. Read more about "Ringside: Memories of World Class Championship Wrestling." Discount Rangers Tickets Texas Rangers vs. Toronto Blue Jays. Visit texasrangers.com/grouptickets, click on University of Texas at Arlington, and use the password GOMAVS to get your discounted tickets. Various times, Globe Life Park. Upcoming games are Baltimore Orioles, Aug. 28-30. Texas Rangers. Movin' Mavs-Lady Movin' Mavs Back-to-School Game Watch the Movin’ Mavs and the Lady Movin’ Mavs play. Free. 6:30-8:30 p.m., Maverick Activities Center. Movin' Mavs. $2 Movie: 'White Room 02b3' Filmed with a 360-degree camera, this movie examines six strangers who wake up in a white room to find out they are part of an extraordinary experiment that could change the face of humanity forever. Not recommended for children under 13. $2. 7 p.m., Planetarium. Volleyball—Maverick Classic Mavericks vs. Campbell University. Welcome Back calendar giveaway, post-game autographs. Tickets $3 with student ID; All-Sports Pass $25, all 2015-16 sports. 7 p.m., College Park Center. Also, vs. Grambling State, 1:30 p.m., and vs. Texas A&M-Corpus Christi, 7 p.m., Saturday, Aug. 29. Athletics. Welcome Back Movie: 'The Avengers: Age of Ultron' Rated R. Free admission and popcorn. Concessions for sale. Lawn seating; bring a blanket or chair. Free. 9 p.m., west lawn, Maverick Activities Center. EXCEL Campus Activities. Blood Drive Give the gift of life with a blood donation. Donate in August for a chance to win FOX Sports Southwest tickets. Register to donate. 9:30 a.m.-3:30 p.m., through Friday, Sept. 4, Library mall; Aug. 31, Sept. 3-4, University Center mall. University Events. Maverick Cookout Featuring the Activity Fair Day Enjoy a $3 hamburger lunch, with a vegetarian option, and learn about campus organizations, clubs, and departments. 11 a.m.-1:30 p.m., University Center mall. Campus Recreation, Student Activities and Organizations. Volleyball Tickets $3 with student ID; All-Sports Pass $25, all 2015-16 sports. Mavericks vs. Abilene Christian. 6:30 p.m. Tuesday, Sept. 8, luau-Mav 1000 tailgate; vs. Louisiana-Lafayette, 6:30 p.m. Friday, Sept.18, Fiesta Friday, Hispanic Heritage Night, Los Mavericks shirt giveaway; vs. Georgia State, 6:30 p.m. Saturday, Sept. 19, volleyball alumni reunion, Camper Reunion Day, Boys and Girls Club Night, post-game autographs; vs. Georgia Southern, 6:30 p.m. Thursday, Oct. 1, tailgate, OctoberFest/beer tasting, Pink Night, Greek Out; vs. Arkansas-Little Rock, 1 p.m. Saturday, Oct. 3, Jersey Day, Blaze's Kids Club, Youth Day, International Frugal Fun Day, post-game autographs. All at College Park Center. Athletics. Free Music Recitals and Concerts Music Honors Recital featuring music faculty and students, Tuesday, Sept. 8; Faculty Organ Recital with Linton Powell, Thursday, Sept. 10; Guest Double Bass Recital with Milton Masciadri of the University of Georgia, Monday, Sept. 14; Clavier Recital with UTA piano students, Tuesday, Sept. 15; Faculty Bassoon Recital with Scott Pool, Thursday, Sept. 17; Voice Division Recital with UTA vocal students, noon-1 p.m., Monday, Sept. 21. All free, at 7:30 p.m. Irons Recital Hall, Fine Arts Building. Music. Planetarium Two new shows—Cosmic Origins Spectrograph and From the Earth to the Universe—are part of the fall schedule, which begins Thursday, Aug. 27. Also showing are Astronaut, Pink Floyd, and Spacepark 360: Infinity. Planetarium. Ornament and Adornment: The Decoration and Application Techniques of African Masks Examine the design and style of decorations on African masks from the Dowdey-Campbell and Brodie African Art Collections. Gallery hours 8:30 a.m.-5 p.m. Mondays-Fridays. Through Aug. 31. Visual Resources Commons, Room 2109 of the Fine Arts Building. Art and Art History. Gallery 76102: 'Tshuchigama/Earthen Kiln' Tsuchigama or “dirt kiln” is recognized by scholars as Japan's earliest high-fire kiln type. Free. 11 a.m.-3 p.m. Tuesdays, Wednesdays, Saturdays; 4-8 p.m. Thursdays and Fridays, Gallery 76102. Through Oct. 10. Fort Worth Center. UTARI Lunch and Learn Ganesh Sankaranarayanan, assistant director for research at Baylor University Medical Center in Dallas, discusses “Robots for Surgery and Human Computer Interaction Applications Through Sense of Touch (Haptics).” Register online. Shuttle available. Lunch provided. Noon, UTARI, 7300 Jack Newell Blvd. S., Fort Worth. UT Arlington Research Institute. Arlington Technology Association Michael McCabe, executive director of the UT Arlington Research Institute, describes how its interdisciplinary team of engineers links discovery, development, and commercialization to achieve new products, new companies, and economic impact for our region, state, and nation. Light breakfast provided. RSVP. Free. 7-8 a.m., Room 100, Nedderman Hall. Arlington Technology Association. 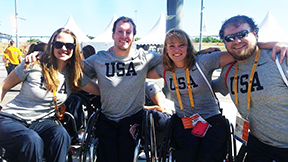 Mavs head to Paralympics: From left, sophomore Abby Dunkin, alumnus Mikey Paye, sophomore Rose Hollermann, and alumnus Aaron Gouge competed with the USA team at the ParaPan Am Games in Toronto, Canada, which was the qualifying competition for the 2016 Paralympics in Rio de Janeiro, Brazil. Hollermann scored 37 points to lead the USA to first place in women’s wheelchair basketball. Paye and Gouge, Movin’ Mavs alumni, led the USA in scoring for a gold medal in men’s wheelchair basketball. UTA jumper Tobi Fawehinmi secured his spot in Rio by taking second in the long jump. Playing for Canada, former Movin’ Mavs player Brent Lakatos won first in the 400-meter track event, and alumnus David Eng was a leading scorer in wheelchair basketball. The volleyball team opens the 2015 season at 7 p.m. Friday, Aug. 28, against Campbell at College Park Center as part of the Maverick Classic. On Saturday, Aug. 29, UTA faces Grambling at 1:30 p.m. and Texas A&M-Corpus Christi at 7 p.m. The Mavericks are predicted to finish fifth in the 2015 Sun Belt Conference Coaches’ Poll. Last season, they were 25-9 overall and 14-6 in conference play. Outside hitter Qiana Canete was selected to the Preseason All-Sun Belt team. As a freshman last year, she led the Mavericks with 376 kills and was second on the team with 480 digs. The Mavericks improved to 3-0 Sunday on their Summer Tour 2015 by blasting the Providence Storm 108-61 in Paradise Island, Bahamas. Junior forward Brandon Williams scored a game-high 17 points on 8-of-14 shooting. Sophomore guard Nathan Hawkins added 14 points, and junior guard Drew Charles chipped in with 10. UTA previously defeated the Real Deal Shockers 93-67 and the PJ Stingers 114-64. Men’s basketball coach Scott Cross has assembled the most challenging nonconference schedule of his tenure for the 2015-16 season. The slate includes games against Ohio State, Texas, UTEP, and Louisiana Tech. Each of the teams won at least 20 games last year and reached a postseason tournament. The Mavericks, who posted a 16-15 record in 2014-15, begin the season with the Homecoming game Saturday, Nov. 14, against Fordham University at College Park Center. • Softball coach Kristie Fox helped Team USA win the Junior World Championships last week in Oklahoma City. She served as an assistant coach for the team, which went undefeated in 10 games. • A meeting for students interested in walking on to the Maverick baseball team will be held at 4 p.m. Monday, Aug. 31, at Clay Gould Ballpark. Those interested must be full-time UTA students and bring proof of insurance and a current physical. • Season and single-game tickets for the 2015 UTA volleyball season are on sale at utatickets.com or by calling the College Park Center box office at 817-272-9595. • Season tickets for men’s and women’s basketball go on sale Monday, Sept. 14, at utatickets.com. Individual game tickets go on sale Thursday, Oct. 1. Upcoming intramural sports deadlines are Madden NFL '15 Tournament, Monday, Aug. 31; co-rec flag football, fantasy football, and college football pick 'em, Thursday, Sept. 3; tennis, Friday, Sept. 4; foosball, Tuesday, Sept. 8; softball, Wednesday, Sept. 9; and racquetball, Friday, Sept. 11.